Finding dish elevation offset angle. Finding satellite dish offset angle. When the front face of the dish is vertical, the beam elevation angle towards the satellite is the offset angle. The advice given below is fine if you already have the LNB correctly positioned relative to the dish. If you don't know the position of the LNB go to the alternative approach in section 2 below. For beam elevation angles lower then the offset angle the front face of the dish needs to be tilted forwards. For beam elevation angles higher then the offset angle the front face of the dish needs to be tilted backwards. Thanks for a most useful site. I just installed my first dish, for Astra 28.2E at home, and found your calculator was just what I needed. 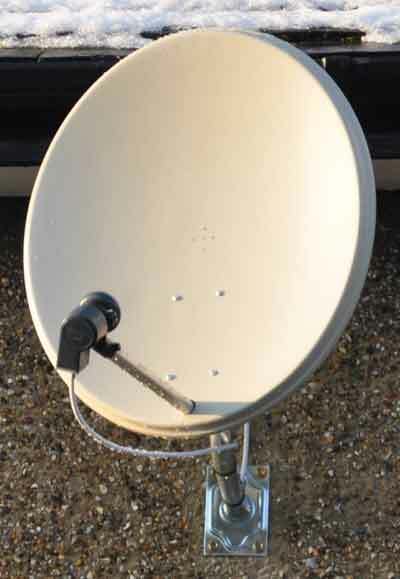 My satellite receiver kit was supplied with 58cm offset elliptical dish which had a very poor angle indicator on the elevation mount, and I was unable to find any signal at all! The offset angle of the dish was not marked on it or given in the instructions. I decided to measure the offset angle with light. With the dish on its back, I placed a chromed dog tag ( a small vanity mirror would do) in the middle of the dish. I removed the LNB and held a laser pointer in the center of the clamp, pointing at the tag. I then used the line of the reflected beam to mark a piece of card which I had fixed to the dish with masking tape. Using the required elevation figure from your calculator and a protractor, I marked what would be a vertical line on the card, and used the dog tag and some cotton thread to make a plumb-line against the vertical line on the card. Back up the ladder, it was easy to set the elevation and I found a signal immediately. The elevation was spot-on. Without a laser pointer, you could find a sight line by looking at the reflection of the LNB in the mirror. I have made a sketch of the dish, and you could add it to your site for the benefit of anyone else with a similar problem. Or do you know an easier method? Wishing a Merry Christmas and a happy New Year to you. 2. Alternative method using calculations, when you don't know the position of the LNB (added April 2014). It is assumed here that the front rim of the dish is flat (check with crossed strings test) measure the diameter of the dish sideways and vertically. Use tight fishing lines up and down and across the front of the dish (which must just touch where they cross) and measure the maximum depth of the dish as accurately as possible. Enter the vertical and sideways diameter and the maximum depth measurements below. Measure to an accuracy of 1mm or better. Ignore rounded edges or rim features and concentrate on the edges of the parabolic curved surface. Once you get the idea, try deliberately inputting measurement values that are 1mm in error so that you see the implications of measurement accuracy on your results. Small measurement errors have a significant effect on the results, so be careful. Use a steel straight edge and a depth micrometer if available. The table works for mm, centimetres or inches also. Just use the same units throughout. When the front flat rim of the dish is vertical the beam elevation angle is the elevation offset angle. Antennas may be used upside down for very low angle elevation operation, e.g. terrestrial applications. Antennas may be rotated to any orientation provided the beam remains pointed at the satellite. Such rotation is normal for polar mount dishes and to enable linear polarisation angle adjustment by rotating the entire dish using a large scale behind the boss or, to avoid rain accumulating in the dish, for example. The position of the phase centre of a feed relative to the middle of its aperture varies with the design, and possibly with frequency. Scalar feeds, with rings, and long conical feeds with a narrow taper angle tend to have a phase centre close to the centre of the aperture. Wide angle conical horns tend to have their phase centre further back inside. You may use inches instead of mm, if desired. Enter measurements with decimal point, e.g 28.45 inches. A is distance from lower edge of dish to lower edge of feed horn. B is distance from lower edge of dish to top edge of feed horn. C is distance from top edge of dish to lower edge of feed horn. D is distance from top edge of dish to top edge of feed horn. Remember that the focal point is half way between A and B and half way between C and D, plus the distance between the feed aperture and the phase centre, which may be quite a way back inside the feed horn.